Cylinder vases offer a wide range of possibilities for the crafter. First, let’s consider how well the simple shape fits in with modern architecture and furnishings. 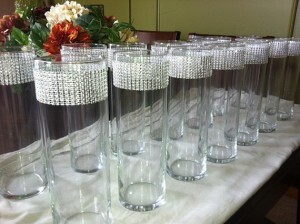 For a simple, modern look fill your transparent cylinder vase with acrylics or colored sand. Or make a floral arrangement with big, bold flowers of the same type, such as calla lilies, tulips, or tropicals, standing at the same height or with a slight rise in the center.Fill the vase completely with your stems so that they will stay upright. Another modern look utilizes spherical floral foam. Soak floral foam spheres in water until they sink just low enough to be entirely covered with water. Cut your flower stems short. Remove your foam spheres from the water and place your flowers into the foam so that the whole stems are in the foam. Only flowers should show, with their lower petals flush with the foam. Continue to place your flowers all around until each ball is covered. This technique is known as pave (pah vay). Good flowers for pave include daisies and smaller poms, or roses if you want a larger ball. Place each ball over the top of a vase filled to the top with water and you have an easy-to-make, modern arrangement. Use three cylinder vases in three sizes, or place a row of vases all the same size going down the middle of a table or the back of a sideboard. If you prefer a more traditional look, you will need as many different kinds of flowers as possible. First fill your cylinder vase with water. Bunch up some curly willow twigs and place them down into the vase. Push them to the bottom. This will serve to hold your stems in place. Next make a grid across the top of your cylinder with bowl tape. Insert foliage such as leather leaf fern* all around the inside of your vase, starting wiht a circle around the outside and working your way inward. This will help stabilize your arrangement. Place a flower with a long, straight, preferably woody stem vertically into the center of your grid, standing up to a height of about twice to two and a half times the height of your vase. Decide how wide you want your arrangement to be. It can go to just the edge of the vase, or it can go over a little, but be careful to avoid a top heavy look. Using the same kind of flower as your first insertion, insert more flowers at different heights but at the same distance from your central flower. These flowers will act as a guide to the rest of your placements. Place different kinds of flowers at different heights but all within the basic shape created by your first batch. Using a wide variety of flowers and colors will give your work interest and texture. In general, light colors and smaller flowers should be placed high while larger flowers and darker colors should be placed lower. Once your flowers have filled out your arrangement’s basic shape, it is time for tiny flowers such as baby’s breath or statice. Place your tiny flowers so that they fill the space between your other flowers, just beneath each one. One mistake beginners make is to place their tiny flowers too high, throwing the whole arrangement off balance. Remember, their stems (and the rest of your flower stems) should not be visible. Now stand back and take a look. Your arrangement should have a smooth, symmetrical shape all around. If something is sticking out or forming a hole, make the appropriate adjustment. Last, it is time for an accent, which is not required but gives a traditional look. You might want to glue a piece of ribbon or lace around your vase to break up the monotony. Or perhaps a bow would look nice. If you decide upon a bow, you probably should not use it to tie a ribbon around the cylinder, since the extra weight could pull your ribbon down. Instead, make a bow by making a collection of loops facing in opposite directions. Form the loops with your favorite hand (the right for most people) and place them together into your other hand. Take care to make all the loops the same size.Make one smaller loop over the thumb of your nonfavorite hand. Cut off the ribbon and slip a thin corsage wire through the small loop . Bring the wire down on both sides, taking care to hold all your larger loops together. Twist the ends of the wire, but do not cut them. Pick your favorite part of your arrangement and place your bow at the edge of the vase, anchoring it down securely by placing the wire stem down into your foliage. Another good accent is simply a small branch of curly willow or blooming fruit tree, placed in a pretty position wherever it looks prettiest. Birds and butterflies are also available and can be glued or wired in wherever you like. A word of caution, though: accent pieces are only to emphasize the beauty of the flowers, but the flowers should always be the stars of the show, so don’t go overboard with the props. When using an opaque cylinder vase, you might want to add decoration to it to give it more texture and interest. Again, this will depend entirely upon your taste. For a modern look simply leave the simple cylinder alone. For a more ornate look, many kinds of ornament are available. For a natural look raffia is always good.For a beach look paint your cylinder vase liberally with glue and roll it in sand. Place it out of the way and avoid touching until the glue is dry. For a wedding use ribbons matching the bridesmaids’ dresses. If you want an exotic look, try using a curly willow stem with a y shape. Turn the y upside down and place over the edge of your cylinder vase so that the two lower parts of the y hang down over the vase. Secure with glue. This look goes particularly well with tropical or exotic flowers. 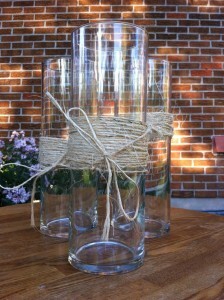 The above is only the beginning of what you can do with cylinder vases. Use your imagination and have fun. * Leather leaf should be cleaned before use, since it tends to arrive dirty and dirt in the water will cause your flowers to die early.